Copyright © 2013 Miho Yoshii et al. This is an open access article distributed under the Creative Commons Attribution License, which permits unrestricted use, distribution, and reproduction in any medium, provided the original work is properly cited. The health benefits of tea have been known for a long time. Over the last quarter-century, several molecules in green tea extract with biological activity have been identified. The main component of green tea extract is catechins, which comprise epicatechin, epigallocatechin, epicatechin gallate, epigallocatechin gallate, and other related compounds. One of the characteristic properties of catechins is antimicrobial activity [1,2]. Although there are several hypotheses about the antimicrobial mechanisms of catechins [3-5], studies with artificial liposomes support the idea that catechins exert their antimicrobial effect mainly by causing damage to the lipid bilayer [6- 8]. 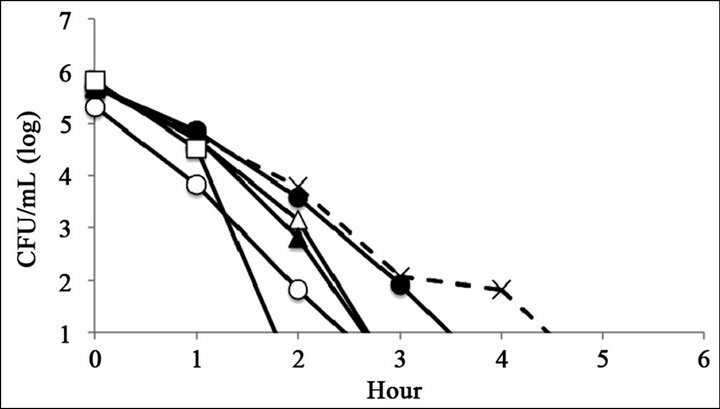 Generally, Gram-positive bacteria are more sensitive to catechins than Gram-negative bacteria. Ikigai et al. proposes that the differences in susceptibility are due to differences in the bacterial cell surface; i.e., the outer membrane of Gram-negative bacteria constitutes a tight barrier to catechins . However, another report indicates that Vibrio species are more susceptible to catechins than other Gram-negative species such as Escherichia coli or Salmonella spp., both of which belong to the family Enterobacteriaceae . While Vibrio species also possess an outer membrane with lipopolysaccharide (LPS), the LPS structure is slightly different from that in Enterobacteriaceae [9-13]. These results suggest that the presence or absence of an outer membrane is not the only factor that may affect susceptibility to catechins; the cell surface structures of Gram-negative bacteria should also be considered. In this study, we investigated the relationship between catechin susceptibility and LPS structure using mutant strains of Salmonella enterica that lack O antigen and have core oligosaccharides of different lengths [14,15]. These rough mutant strains had increased susceptibility to catechins, indicating that the O antigen and core oligosaccharide provided some protection against the antimicrobial activity of catechins. Rough mutant strains of Salmonella enterica serovar Minnesota (R50, R5, R7, R4, and R595) were used in this study. These strains have been described previously [14- 16]. The structure of the O-antigen and R-core oligosaccharide of these strains is shown in Figure 1. The wildtype strain LT2 (S. enterica serovar Typhimurium), which possesses full-length LPS, was used as a reference. Bacteria were routinely grown on nutrient agar (Eiken, Tokyo, Japan) and cultured overnight in Heart Infusion Broth (Nissui Pharmaceutical Co., Ltd., Tokyo, Japan) at 37˚C. (–)-Epigallocatechin and (–)-epigallocatechin gallate were purchased from Sigma-Aldrich (St. Louis, MO). 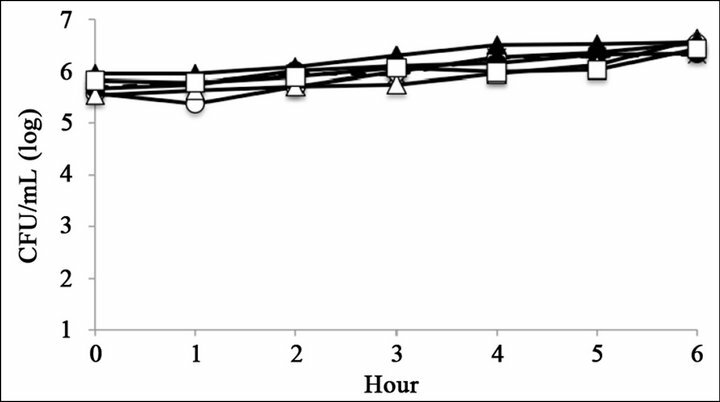 Both agents were prepared to give final concentrations of 0.25, 0.5, and 1 mg∙mL−1 in PBS with an inoculum density of 1 × 106 to 1 × 107 CFU∙mL−1 in a 1 mL volume. 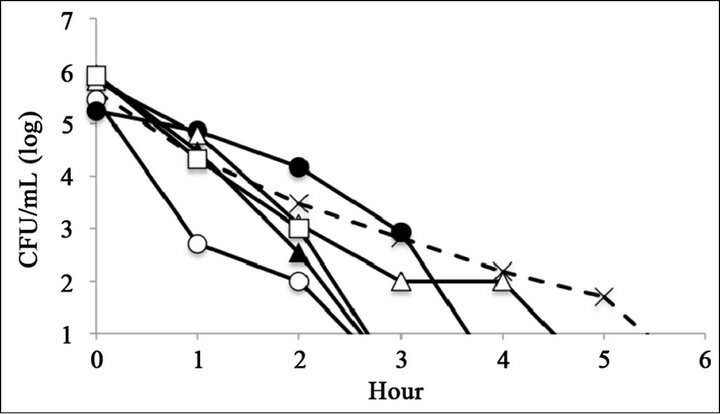 Antim- icrobial activity of each agent was assessed by time-kill assay. Suspensions were incubated in 96-well plates at 37˚C without shaking for 0 to 6 h, and aliquots were removed at 1-h intervals. To obtain colony forming unit counts, dilution series were prepared in PBS (1 × 10−1 to 1 × 10−9), plated on agar plates (three 100 μL drops per dilution), and incubated at 37˚C overnight. For a negative control, PBS was used instead of catechin. 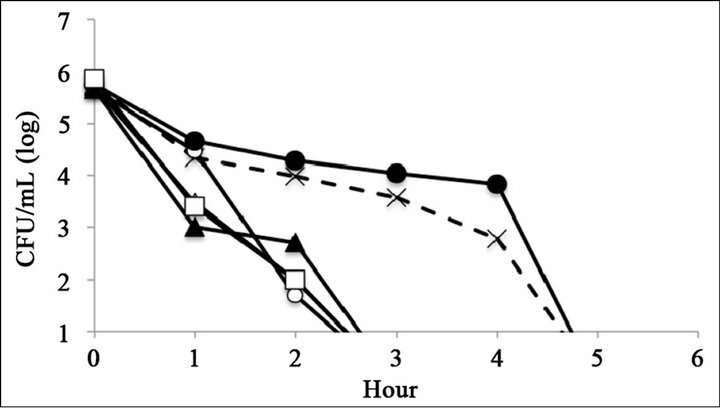 The antimicrobial activity of catechins was evaluated by time-kill assay (Figure 2). The reference strain LT2 survived 6 h with 0.25 mg∙mL−1 of (–)-epigallocatechin or (–)-epigallocatechin gallate (Figures 2(C) and (F)). 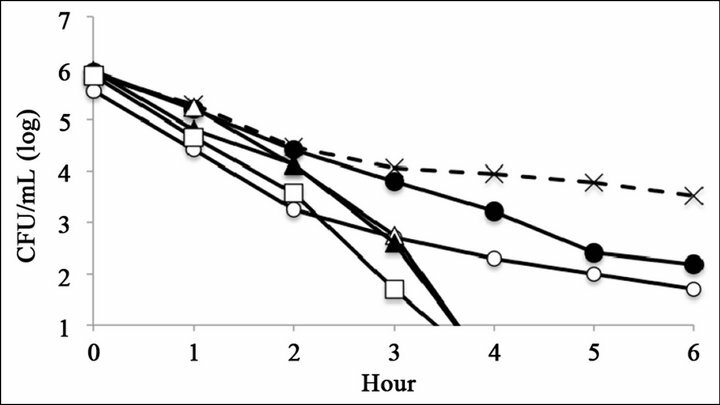 The mutant strains R595, R4, and R7, which possess relatively short core oligosaccharides, were killed within 6 h at all tested catechin concentrations (Figure 2). The mutant strain R5, which possesses Rc LPS (i.e., galactosylglucose in the core of Rd1 LPS (strain R7)), survived 6 h with 0.25 mg∙mL−1 of (–)-epigallocatechin or (–)-epigallocatechin gallate (Figures 2(C) and (F)). The mutant strain R50, which possesses Ra LPS (i.e., full-length core oligosaccharide but no O-antigen), survived 6 h with 0.25 mg∙mL−1 of (–)-epigallocatechin gallate (Figure 2(C)). Figure 1. Structure of the LPS of the Salmonella enterica strains used in this study. The LPS phenotypes (Ra, Rc, Rd1, Rd2, and Re) and each mutant strain (R50, R5, R7, R4, and R595) are shown (modified from Osborn (1969)). Glc: glucose; GlcNAc: N-acetyl-glucosamine; Gal: galactose; Hep: heptose; P: phosphate; ETN: ethanolamine; KDO: 2-keto- 3-deoxyoctonoic acid. this difference is caused by the repulsion between catechins and the surface of Gram-negative cells, which are coated by LPS . However, among Gram-negative bacteria, Vibrio species show higher sensitivity to catechins than Enterobacteriaceae . These reports indicate that sensitivity to catechins is associated with several molecular mechanisms and is not determined only by the presence or absence of LPS on the cell surface. The components of LPS may also affect sensitivity to catechins. LPS contributes to the mechanical stability of the cell and acts as a barrier to antimicrobial molecules. LPS is a complex glycolipid that consists of three domains: lipid A, core oligosaccharide, and O-polysaccharide. Lipid A is a highly conserved hydrophobic domain that is responsible for the endotoxic properties of many types of LPS. The O side chain, which provides a hydrophilic surface layer, is attached to lipid A through the core oligosaccharide. The O side chain is a polymer of glycosyl residues, and its size, or the number of repeating units, varies among species, strains, or the chemical and physical conditions in which the bacteria are grown. Generally, this size heterogeneity manifests as a ladder pattern in SDS-PAGE. 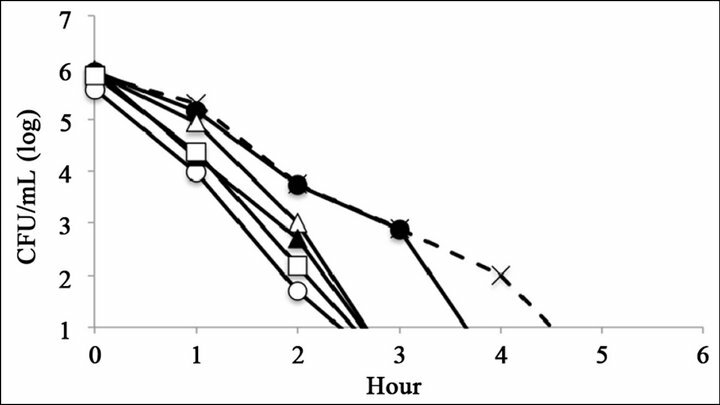 In this study, the antimicrobial activities of catechins for LPS deficient mutant strains were evaluated by time-kill assay (Figure 2). The absence of the O side chain and a shorter core oligosaccharide increased sensitivity to the antimicrobial activity of catechins. Deficiencies in LPS may affect the physical properties of the cell surface, such as rigidity. Another possibility is that the reduction in cell surface hydrophilicity resulting from the absence of the O side chain may allow catechins to more easily access the lipid bilayer. Although other factors, such as multi-drug efflux pumps, may also be involved, the structure of LPS on the cell surface appears to be important for tolerance of the antimicrobial activity of catechins. Figure 2. Bacterial killing assay for different concentrations of catechins. 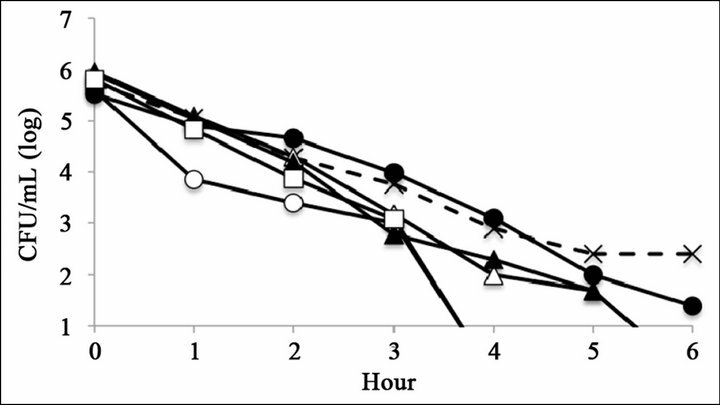 Antimicrobial activity of (a) 1 mg∙mL−1 (b) 0.5 mg∙mL−1, and (c) 0.25 mg∙mL−1 of epigallocatechin gallate, and (d) 1 mg∙mL−1, (e) 0.5 mg∙mL−1, and (f) 0.25 mg∙mL−1 of epigallocatechin, (g) was compared with control. Symbols were as follows: LT2: cross with dashed line, R50: open circle, R5: filled circle, R7: open triangle, R4: filled triangle, and R595: open square. This work was supported by Grant-in-Aid for Young Scientists (KAKENHI) Grant Number 18791632 from Japan Society for the Promotion of Science.